Romania, an Eastern European country, has generally a continental climate, with cold winters and hot summers. The Black Sea coast has a slightly milder climate, but not by much, since it often receives air masses coming from inland. In the long Carpathian range, which crosses the country with a semicircular shape, the weather becomes colder and wetter with increasing altitude: in winter, snowfalls are frequent, while in summer, thunderstorms occur in the afternoon. Precipitation is not abundant in inland plains, since it amounts to around 600 millimeters (23.5 inches) per year, although it is well distributed over the seasons, with a maximum in May and June, mainly because of afternoon thunderstorms. Winter, from December to February, is cold throughout Romania. Cold air stagnates in the lowest layers of the atmosphere, and the sky is often cloudy. Snowfall is quite common, but not abundant; in inland plains, there are about thirty days with snowfall per year. In Bucharest, the ground is often covered with snow. During winter, temperatures are fairly uniform across the continental region, and decrease mainly with increasing altitude. 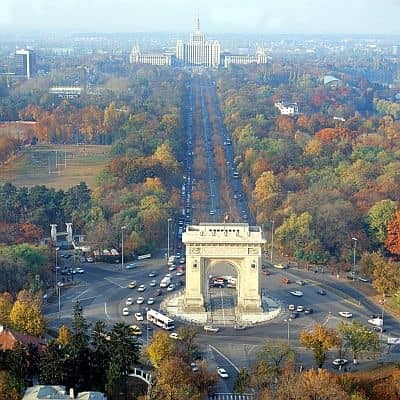 In the main cities located around sea level (Bucharest, Timisoara, Iasi, Craiova, Galati etc. ), the average daily temperature in January hovers between 0 °C (32 °F) and -2 °C (28.5 °F). In Bucharest, the average is -1 °C (30 °F). In the Transylvanian Plateau, west of the Carpathians, winter is slightly colder: in Cluj-Napoca and Sibiu, both located at 400 meters (1,300 feet) above sea level, the average in January is -3 °C (27 °F). Romania, like other parts of the Balkan Peninsula, is exposed to outbreaks of cold air masses from northern Europe or Russia, most likely in winter and spring. They were more frequent in the past decades, when the climate was colder, however, they can still lower the temperatures to around -20 °C (-4 °F), while in summer, a bit of cool air arriving at high altitudes, in contrast with hot air lying in the lowest layers, can give rise to thunderstorms. During winter, the mildest lowland area of Romania is Dobrudja, the stretch of plain east of the Danube River, which receives the influence of the sea. On the Black Sea coast (see Constanta), the average temperature in January is just above freezing, around 1.5 °C (35 °F). Summer, from June to August, is quite warm in the north, in the plains and hills of Transylvania (the region west and north of the Carpathian Mountains) and in the region east of the Carpathians, on the border with Moldova: in Cluj-Napoca and Sibiu, around 400 meters (1,300 feet) above sea level, highs are around 26 °C (79 °F), while in Iasi, near the border with Moldova, they are around 28 °C (82 °F). South of the Carpathians, the region of Wallachia, where Bucharest is located, is warmer, and it's often hot: here, the maximum temperatures in July and August are 30 °C (86 °F) on average, and they quite easily reach 35 °C (95 °F) and even more. Sometimes, however, it can get hot even in the northern plains and hills. Along coast of the Black Sea, the weather in summer is nice and pleasantly warm, sometimes even hot, but tempered by the breeze. Summer is a fairly rainy season, mainly because of afternoon thunderstorms, which occur especially in May and July, and are most frequent and abundant in the mountains. Sometimes, these thunderstorms are so strong that they can cause floods. The amount of sunshine in summer is good in the lowlands, while cloud cover is more frequent in the mountains and in Transylvania, where, however, the sun often shines, especially in the morning. Wallachia, the southern lowland area (see Craiova, Bucharest), has a continental climate: winter is still cold, while summer is warmer than in the rest of Romania. In the capital, Bucharest, winter is cold and gray, with snowfalls and frosts. During cold spells, the temperature can drop to around -15 °C (5 °F). In the coldest winters, the temperature dropped to much lower values: to -27 °C (-17 °F) in January 1985, to -24 °C (-11 °F) in January 1987 and January 2010, to -22 °C (-7.5 °F) in December 2002 and February 2012, but previously, it had dropped to -32 °C (-25.5 °F) in January 1942, and -29 °C (-20 °F) in February 1929. Summer is hot and sunny, though thunderstorms can break out in the afternoon. On hot days, the temperature can reach 35 °C (95 °F); in June 2007 it reached 39 °C (102 °F), and in July 2000 as high as 42 °C (107.5 °F). Here are the average temperatures. Precipitation in Bucharest amounts to 595 mm (23 in) per year; the wettest period is from May to August because of afternoon thunderstorms. Here is the average precipitation. The sun in Bucharest is rarely seen From November to February, since in periods of high pressure, when the weather would be good, fog and low clouds are often formed. On the other hand, summer is quite sunny. Here are the average daily sunshine hours. In the Transylvanian Plateau, west of the Carpathians (see Bistrita, Cluj-Napoca, Sibiu), winter is very cold, while summer is a little cooler because of the altitude. Here are the average temperatures of Cluj-Napoca, 400 meters (1,300 feet) above sea level. The sun in Cluj-Napoca is rarely seen from November to February, while summer is quite sunny. Here are the average daily sunshine hours. Precipitation in Cluj-Napoca amounts to 595 mm (23 in) per year; here too, the wettest period is from May to August because of afternoon thunderstorms. In winter, precipitation is weak but quite frequent, and often occurs in the form of snow. In the mountains, the climate becomes colder, but also more humid with increasing altitude. In the valleys located between the mountains, thermal inversion often occurs, so it is very cold at night. Here are the average temperatures of Miercurea Ciuc, located at 660 meters (2,200 feet), in Harghita County. Precipitation in Miercurea amounts to 575 mm (22.5 in) per year, as usual, with a summer maximum due to thunderstorms. At the Bran Castle, which according to legend would be Dracula's castle, located at 750 meters (2,450 ft) above sea level, winters are cold and snowy, while summers are pleasant, with highs around 23 °C (73 °F) and cool nights, but also possible thunderstorms in the afternoon. A similar climate is found in the Poenari Castle, located at 820 meters (2,700 feet) of altitude, which should be the real Dracula's Castle, aka Prince Vlad III of Wallachia. The Bucovina Monasteries are located at the foot of the Carpathians, in Romanian Moldavia, in the north-east of the country: during the day, it can get hot in July and August, while nights remain cool. The monasteries are located between 300 and 650 meters (1,000 and 2,100 feet) above sea level: the highest is the monastery of Moldovita, which is located at 630 meters (2,065 feet), the lowest is the monastery of Probota, which is located at 290 meters (950 feet); the others (Putna, Humor, Sucevita, Voronet, Dragomirna, Arbore) are located at intermediate altitudes. In the Ceahlau Massif, located in the Eastern Carpathians, at 1,900 meters (6,200 ft), the average temperature ranges from -8 °C (17.5 °F) in February to 11 °C (52 °F) in August. At higher altitudes, the temperatures are even lower, and it is cold even in summer. Here is the average temperature in Mount Omu, 2,500 meters (8,200 feet), the highest peak of the Bucegi Mountains, near the towns of Busteni and Sinaia. A similar altitude is also reached further to the west, in the Fagaras Mountains, where the highest mountain in Romania is found, that is, Mount Moldoveanu, 2,544 meters (8,346 ft) high. In Mount Omu, precipitation reaches 1,000 mm (40 inches) per year, with a maximum of 150 mm (6 in) in June. On the Black Sea Coast, the climate is slightly milder than in inland areas; however, the winter is still cold, while the summer is warm and sunny, sometimes hot, although tempered by the breeze. In winter, a cold wind can blow, and it can snow and freeze. On colder winters, the Black Sea along the coast can even freeze, as happened in February 2012. So, winter along the coast of the Black Sea, albeit milder than in the interior, is still cold. In Constanta, the largest city of the coast, the average temperature ranges from 1.5 °C (35 °F) in January to 23 °C (73.5 °F) in July. In the coldest winters, the temperature dropped to -17 °C (1.5 °F) in January 1963, to -18 °C (0 °F) in January 2010, and to -15 °C (5 °F) in February 2012. In the hottest summers, the temperature reached 38.5 °C (101.5 °F) in July 2007, and 37.5 °C (99.5 °F) in August 2006. Here are the average temperatures. Being that the summer thunderstorms are less frequent, precipitation along the Black Sea Coast is quite low: it amounts to around 385 mm (15 in) per annum, and from 20 to 40 mm (0.8 to 1.6 in) per month throughout the year. Here is the average precipitation in Constanta. Along the coast, where afternoon thunderstorms are rarer, the sun in summer shines even more often. On the other hand, here too, winter is quite dull. The temperature of the Black Sea is acceptable for swimming in summer: it's around 23 °C (73 °F) in July and 24 °C (75 °F) in August, while it is a bit cool in June and September. The best time to visit Romania is from May to September. June is the rainiest month because of afternoon thunderstorms. July and August can be hot in inland plains, especially in the south, ie in Wallachia (see Bucharest), so you can choose May, June and September, especially if you don't like the heat. In May, the country is in bloom, and the temperature is generally pleasant, even though afternoon thunderstorms are already possible. September is usually a pleasant and quiet month, with little rain; sometimes, warm and sunny weather lasts until October. The Black Sea Coast in summer is good for a beach holiday, but in winter, since it has an average temperature around freezing and can sometimes experience wind and snowfall, it's certainly not a refuge from the cold European winter. In winter: bring warm clothes, such as a sweater or fleece, a down jacket, a hat, gloves and a scarf, and a raincoat or umbrella. In summer: bring light clothes, t-shirts and shorts, but also long pants, a light jacket and a sweatshirt for the evening; an umbrella. Some heavier clothes for the mountains.